The Deal: bikes are available. Warning: At the special Price, sizes always sell out fast and prices may increase without notice. Lock in your deal and get your best mountain bike deal now. The Process: When you order, your card is billed for the full amount. You'll get an auto-email the next business day. Fri/Sat/Sunday orders get emails on Monday. Weekends/Holidays are not counted as "days". Your Shipping Address: Please ensure your address is correct when you order. Last minute changes incur delays and/or extra costs. Shipping address can be changed on the 3rd page of checkout. Click on "change" beside the address. FEATURES PRO-X Sizing. Proportionate sizes for Optimized Ride Performance: 14.5/16.5 sizes= 27.5 wheels, 17/18.5/21"=29er. Best handling through optimized wheelsize. As noted in the pulldown menu. We have sold thousands of Motobecane Bicycles. 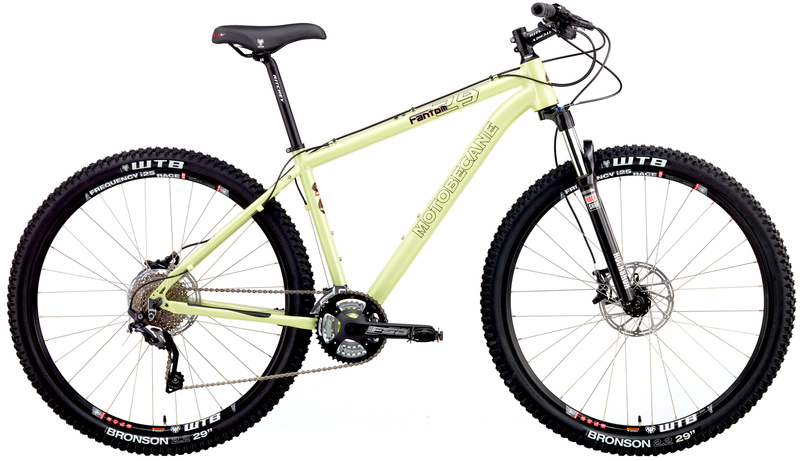 Bikesdirect.com is an authorized dealer and all the bikes we sell are covered by the factory warranties. Mountain Bike Action: "Motobecane U.S.A. has a reputation for delivering a lot of bike for the bucks." Road Magazine: "A lineup of bikes that is deep and varied, it is likely that Motobecane has a complete rig that will suit your fancy, whatever your discipline may be." Bicycling Magazine: "Motobecane USA…is known for turning out exceptionally light production bikes with great components at reasonable prices." RoadBike Action: "Motobecane assembled a great performance value that can uphold its racing heritage at a high level without breaking the bank. " Even when reviewed at list prices, magazines feel Motobecane bikes are incredible values. When you consider the discount BIKESDIRECT offers on these super quality bikes; nothing else comes even close! 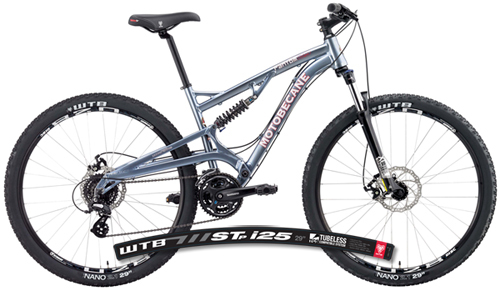 What do Customers Compare this Motobecane Fantom DS Bike to? Giant Stance mountain bike line $1500 and UP + Local taxes Uses "FlexPoint" Suspension. Per Giant's info this is a simple single pivot design. It relies on flexing of the rear stays to provide suspension instead of bearing pivots. From an engineering standpoint, this will increase fatigue loading of the rear stays much more. Fact: Higher fatigue loading = shorter material life. Compared to Giant's flexing stay design, the Motobecane Fantom full suspension bikes have sealed bearing pivots which means tremendously lower fatigue loads on the rear stays. Fact: Lower fatigue loads = longer material life. The Giant Stance 27.5 base model is $1500+tax. It's a Single Pivot 27 speed Alivio bike and house brand/generic parts. Giant has NO Shimano cranks, NO rear lockout, NO TCS Tubeless compatible wheels. TCS Tubeless compatible wheels are worth about $500 if you were to upgrade to these later. NOTE: All Pro riders use tubeless compatible wheels for very good reasons When converted to tubeless, tires are virtually flatproof and offer incredible grip and ride quality. Why spend $1500 or more and get a lower spec bike with flexing rear stays and lower tech rims? If you have ridden one you know why you want one. 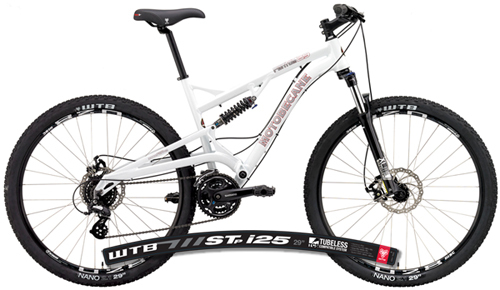 If you have ever wanted to try one, this is the best deal on a well equipped 27.5 / 29er full suspension bike with powerful Disc Brakes and front and rear lockouts. Get Tubeless tech rims now. Tubeless wheelsets of this caliber are normally around $500 to 800+ So this is an incredible deal: You are getting a complete full suspension bike with a pro-quality TCS Rim wheelset. Get amazing technology, now! ...Say goodbye to air compressors, tire levers and pinch flats. Say hello to your full riding potential. " Motobecane's new hydroformed aluminum frame is so well-designed and engineered by Kinesis that some customers have said it will make most folks forget about Lindsay Lohan or any of Americas top models, past, present or future. Others have suggested it would be a survivor of anything Jeff Probst could ever think up. We say it's kind of like Angelina Jolie in Tomb Raider, beautiful and tough. Shimano's drivetrain brings with it the legendary quality, durability and performance Shimano is known for, all packaged to meet the ever-evolving demands of today’s riders. Motobecane USA has really dialed in a race-proven geometry into this phenomenal ride. The handling is very responsive and yet stable. Descents, Singletrack and switchbacks are all handled with ease. Slow speed and high speed, technical and flat-out hammering, you will go faster because this bike is so darn capable. These bikes are selling fast. Get yours before they are all gone! Features PRO-X Sizing with Optimized wheel sizes. Smaller sizes get the 27.5 rims, Larger get 29er rims. This means you get the best possible handling bike. This is a general guide. Between sizes? Size down for lower handlebars, more straddle clearance, short arms/legs/torso. If you size up, you may touch when straddling. Size up for taller handlebars, long arms/legs/torso. Our low price Saves You Hundreds Compare to... Nothing compares.